The death of a three-month-old girl has sparked warnings for parents about the dangers of letting babies sleep in bouncher and swings. “I woke up at around 4.30am and saw that Leia-Mai was not breathing and her lips had turned blue,” she said. “I took her out of the swing, gave mouth-to-mouth resuscitation and dialled 999. When the paramedics arrived I pleaded with them to get my baby to breathe. 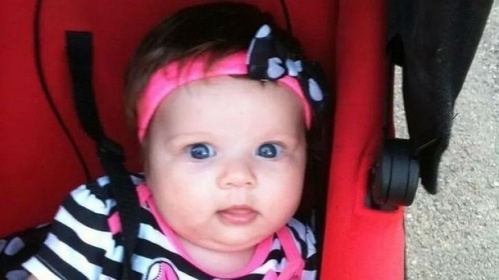 A label on the baby bouncer Leia-Mai was in warned children should not be left in it unattended. Since the the baby’s death it has been changed and now parents are warned that baby bouncers are “not intended for long periods of sleeping”. The inquest was told the cause of Leia-Mae’s death was inconclusive. Pathologist Dr Thomas Martin said Sudden Infant Death Syndrome was a “possibility”. “Sudden Infant Death Syndrome was investigated but we cannot prove that this was a cause of death,” he said. “There were fears that the baby had a viral infection some days before death but my examination found no signs of any infection. “On June 14, 2014 Leia-Mae, a 12 week and three day old baby had been given her night-time bottle and been placed in a baby swing,” she said. “The swing has a warning label attached to it, stating never leave child unattended. Leia-Mae’s mum fell asleep and awoke at approximately 0430 hours on the 15th of June. “She immediately discovered that Leia-Mae was not breathing and called an ambulance. Paramedics attempted resuscitation but were unable to revive Leia-Mae and she passed away at her home address. “Accidents have occurred where baby has become trapped in the restraining, when the bouncinette has fallen from a high surface or been placed where baby could get caught in curtain or blind cords,” the statement reads.